I just purchased a beautiful selection of African trade beads known as "Beach Glass" or "Sea Glass" for it's frosty texture. These strands or necklaces are vintage. The beads are Italian and can be as old as 150 years old. They are strung on cotton with raffia wrap. They are available in three sizes: Jumbo, Large and Medium. Here's the scoop. The jumbos are pretty much gone. I bought all that I could get. My contact tried to get more from Kenya and nothing came. Red beads are gone in the jumbo and large size. Just a few in the medium left. 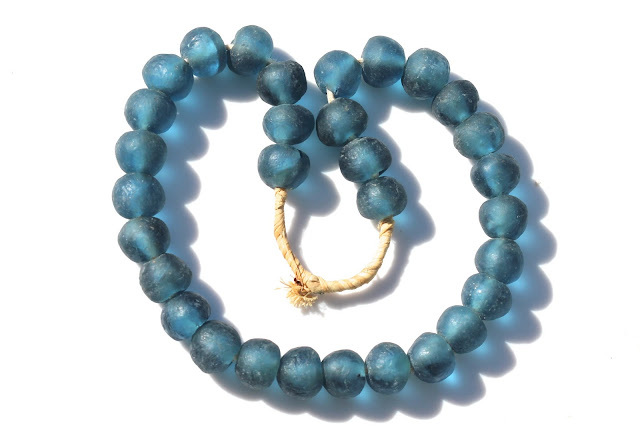 I bought the last of the cobalt large beads. No more came in from Kenya. Hoping more will be here in the future. There are some colors that I have not offered before that just came in to the US. A bright 7-Up bottle green, a new blue and cola brown. I have some new confetti colors in the medium beads with some indigo that I am SO coveting right now. What you see here, I have about twice this amount in stock. I will be offering them first in my One Kings Lane Store, then they will be appearing on my website at a later date. One Kings Lane sells them as fast as they are offered in those amazing events. Many colors will be exclusive to One Kings Lane. Here is a sampler of what is coming soon! Update!!! Just added to my website! Click on photos to visit listings.